The vase gives the arrangement a modern look. You can buy a vase like this (click here). If you have your flowers and supplies you are ready to begin. 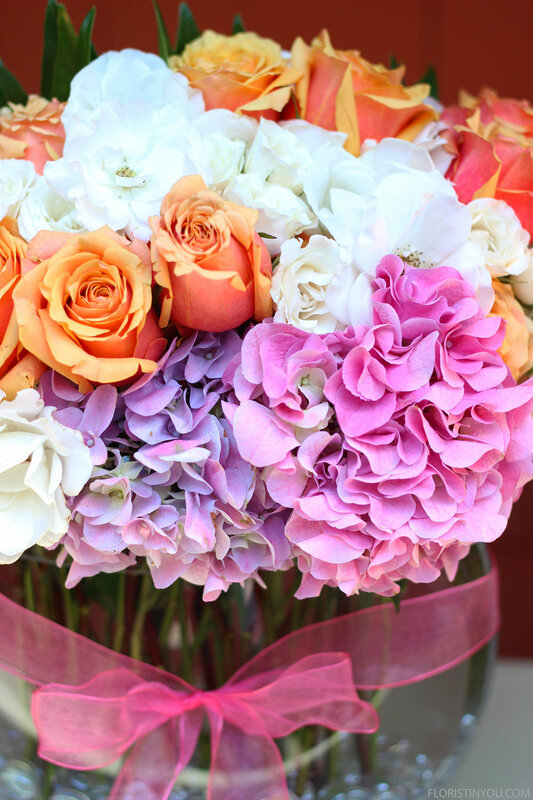 Here are the flowers that you will use. You will use one bag of flat clear marbles. Add water to 2 inches below the rim. 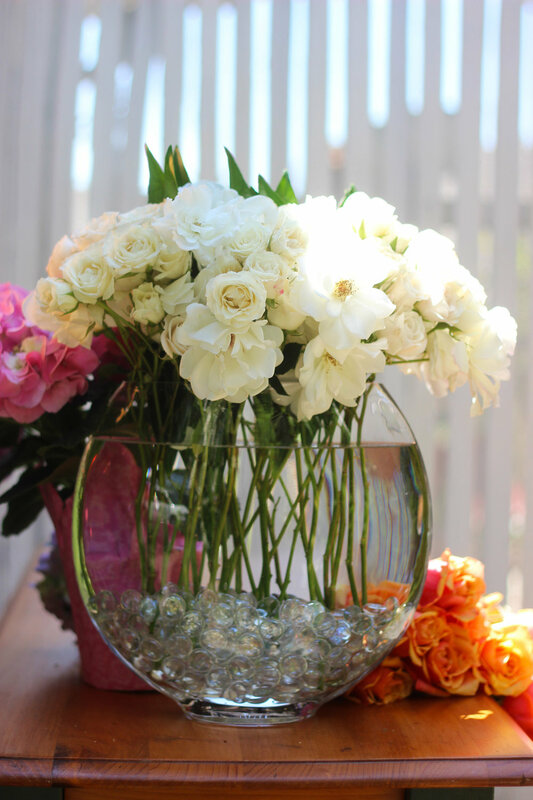 Start by placing Iceberg Roses in vase with stems straight down. Place 4 greens stems in the middle. Pull off all leaves that will be below the water level. 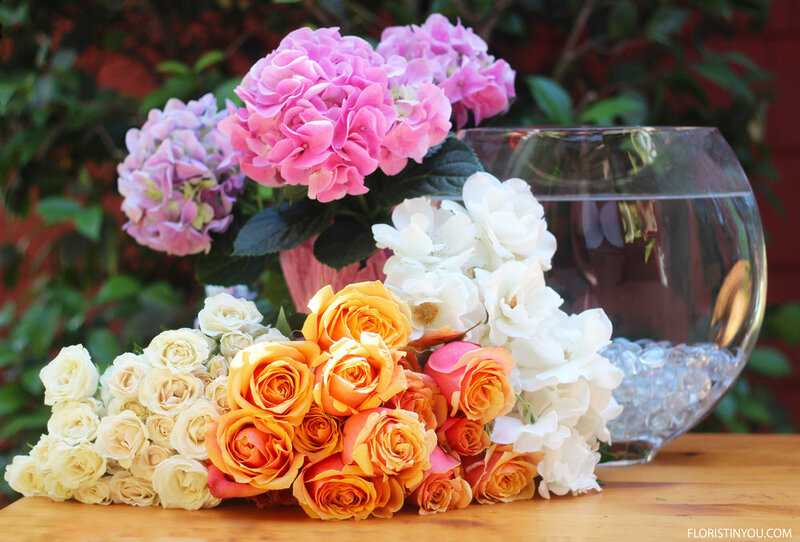 Place Spray Roses in with the Iceberg Roses with stems straight down. Wire roses and place among the Iceberg and Spray roses with stems going straight down. Cut hydrangea blooms as long as you can. Pull off leaves that will be below the water level. Add large Hydrangea bloom low in the front, and one low in the back. Add another Hydrangea bloom next to one in front and in back. Then tie your ribbon in a tight bow. Fold ends cut on 45 degree angle. The colors really play off each other. The pinks, oranges and golds are pretty together. Here's a look from the top. And sitting in the window on a spring day. It is being admired by a bronze nymph. I hope you enjoy it too.